The U.S. Postal Service honored singer and songwriter John Lennon with a stamp with the latest addition to its Music Icons stamp series at a first-day-of-issue ceremony in New York City's Central Park. Lennon, a rock and pop music icon, is world renowned as a founding member of the Beatles and a successful solo artist. The Beatles still hold records for a string of hits released from 1962-1970, including "All You Need is Love," which served as an anthem for Lennon's humanitarian endeavors. Lennon's last studio album was released in 1980. Lennon was posthumously inducted into the Songwriters Hall of Fame in 1987 and twice inducted into the Rock and Roll Hall of Fame: as a member of the Beatles in 1988 and as a solo artist in 1994. Postmaster General and CEO Megan J. Brennan welcomed Lennon family members, photographer Bob Gruen and other noted guests who were on hand for the stamp dedication at the Naumburg Bandshell in Central Park. "It's a privilege to commemorate the life of John Lennon – one of the most celebrated musicians and iconic personalities of the 20th century," said Brennan. "The world was influenced by John Lennon's music and his commitment to the ideals of peace and unity. We continue to be inspired by his memory." The Music Icons: John Lennon Commemorative Forever stamp features a photo of Lennon taken by noted rock 'n' roll photographer Bob Gruen in August 1974. Taken on the rooftop of Lennon's Manhattan apartment, the photograph is part of a series of images taken by Gruen during the photo session for Lennon's 1974 album Walls and Bridges. The original black-and-white image was treated in gradations of color to create the artwork for this stamp, which is available for purchase starting today. Other musicians who have been part of the USPS Music Icon stamp series include Elvis Presley, Ray Charles and Sarah Vaughan. News of the stamp is being shared on social media using the hashtags #MusicIcons and #JohnLennonStamp. Followers of the Postal Service's Facebook page can view the ceremony live at facebook.com/USPS. For those attending the dedication event, no autographing will take place at the ceremony. As a child, Lennon was encouraged by his cousin to collect stamps. 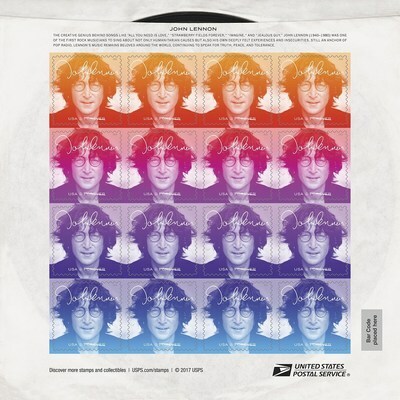 His stamp album with handwritten notes is on display from September 7, 2018 to February 3, 2019 at the National Postal Museum in Washington, D.C., and can be viewed on online at postalmuseum.si.edu/lennon. The young Lennon also displayed a precocious talent for cartoons and drawings. His art and childhood stamp collection have since been exhibited around the world. The stamp pane is designed to resemble a vintage 45-rpm record sleeve. One side of the pane includes the stamps and brief text about Lennon's legacy. A black-and-white photograph of Lennon seated at his white piano appears on the reverse, along with Lennon's signature and the Music Icons series logo. Taken by photographer Peter Fordham, the original photograph was used to promote Lennon's landmark 1971 solo album, Imagine. Art director Antonio Alcalá designed the stamp sheet with designer/typographer Neal Ashby.